So your kid is showing interest in gymnastics lately? Well, in that case, you can gift them a gymnastics bar for home. This home bar will save you a great deal of money in the long-term compared to the cost of paying your kids a gym membership fee. What’s more, it’ll allow your kid to practice their new skill safely, at the comfort of your home…and under your close supervision. Since a gymnastic bar is a significant investment, you should be very careful which one you buy for your kid. Ideally, you want something that’s sturdy and durable, grows with your kid (they grow too fast, you know), and has everything your kid needs to kick off their athletic training the right way. Right below here, we’ll delve into everything you need to know before buying a gymnastic bar for your budding gymnast—including the Top 10 models you can find on the market today. When Can a Child Start Gymnastics? One thing that causes a hell of confusion among many parents is deciding on the right time to introduce their child(ren) to gymnastics. Gymnastic experts and coaches agree that the perfect time to introduce your child to gymnastics is at around 4-6 years of age. It is around this age when kids hit their maximum level of flexibility as explained by Andrew Solway in his 2013 book titled "Exercise: From Birth to Old Age." You might, however, argue that there are gymnastic classes for kids as young as 2 years. Such courses usually focus on developing passion and self-confidence for the sport as well as body awareness. In other words, it’s still a good idea to get your young gymnast home gymnastics bar at around the age of 2-5 years old. They can then learn tumbling and basic gymnastic moves like cartwheels, somersaults, backward rolls, etc. Once they’ve mastered these basic skills, they can them move to serious gymnastics (you might even consider getting them an instructor for REAL gymnastics training). How old is too old for your child to participate in gymnastics? You’d want to make sure that you introduce your kid to gymnastics before they hit age 12. If they start when they’re over 12 years of age, they might not have enough time to develop the skills they need to go against their counterparts who started way back when they were toddlers. Don’t get it twisted though…your kid can develop an interest for gymnastics at any age. But above age 12, they should consider sticking to recreational gymnastics only. IMPORTANT: Never force your kid into participating in gymnastic activities if they’re not ready for it. As with any other athletic activity known to humankind, passion is key for your young one to enjoy (and benefit from) gymnastics. The first gymnastics bar for home on our list is the Milliard Adjustable Height Kip Bar Pro. 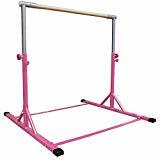 This is a rock solid piece of equipment that comes ready to enhance the gymnastics workouts of your kids. It can safely and steadily support all the basic, intermediate, and advanced moves—making it ideal for children who are just starting out. No additional pieces or extensions kits are needed to stabilize this bar! Designed from premium steel grade material, this kip bar is exceptionally durable and sturdy enough to last for countless years of use…even with daily/regular use. Another exciting thing about this bar is that it’s fully adjustable. In simpler words, it allows you to customize its height (from 33” all the way up to 57” which means 12 height options) to suit your child’s skill level and ability. We also like the fact that its bar is made out of fiberglass. This is great in that it not only ensures solid strength but also offers some added flexibility so that you can easily catch and hold your young gymnast in hip circles, kips, casts, and so on. Don’t forget that the fiberglass bar is also comfortable to grip for your little one. To add to the overall gymnastics fun, each bar I shipped alongside two sticker sheets to allow your kid to personalize and decorate it. The bar has a maximum weight capacity of 140lbs and will handle gymnasts between the height of 2.5 and 5.5ft tall. Next up, we have the Z-Athletic Expandable Kip Bar. This is an upgraded model from Z Athletic, a company that has been designing horizontal bars for more than a decade. And it comes with even greater additional stability which allows for higher weight/skill limit. It has a direct pulldown weight limit of 300lbs and usage weight limit of 120lbs. Another area where this bar excels revolves around its expandable and adjustable feature. You can easily customize its height from as low as 36” all the way up to 58” with the pin-lock mechanism. This particular feature enables it to be used by multiple ages and heights. The bar also comes with a commercial-grade gym mat (measures 4ft x 6ft x 2in) at no extra cost. By the term commercial-grade, we mean that this mat is designed using industry-standard high-strength, cross-linked polyethylene foam that’s covered in top-quality 180oz vinyl. 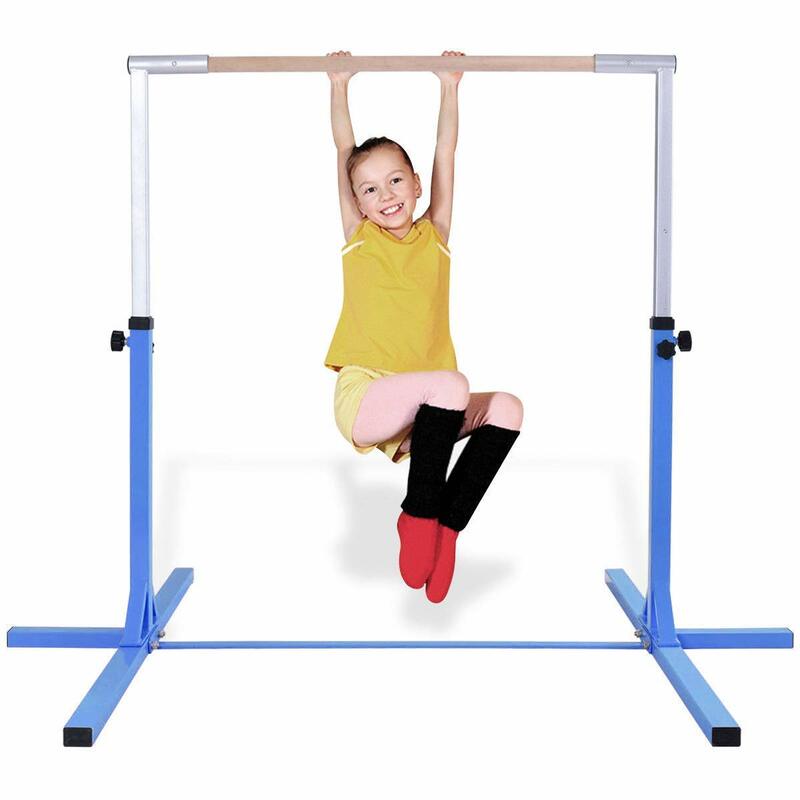 As for the entire gymnastic bar, it also boasts of durable and sturdy construction that’ll see your child through years and years of practice. The legs alone are made using tough steel metal while the core features fiberglass material. This premium construction is actually responsible for the bar’s unmatched stability. Putting together this horizontal bar is the easiest part. You only have less than 10 bolts to put in place. And the only tool you need to get the job done is a wrench. This makes the assembly easy and super-fast. Our 3rd place for top kids gymnastics bars goes to this Expandable Gymnastics Jr Kip Bar from Tumbl Trak. From start to finish, this training bar is designed with your kids in mind to ensure they have the perfect platform for launching their athletic career. It comes in several appealing color options so that you can choose what appeals to your young gymnast. The kids’ gymnastics bar also boasts of high-quality construction. This is characterized by sturdy steel (with powder coated finish) plus 1-½ inch diameter solid maple wood. These two combine to give the bar a so robust feel that it can survive the most rigorous training sessions for years and years to come. Like the previously discussed models, this bar also comes optimized for ease of use. It allows you to set its height from as low as 38 inches all the way up to a height as high as 56 inches by simply dialing the spring pin knobs. As your kid grows bigger and stronger, you can use the base extension kit to increase the stability of this bar from 75lbs up to 125lbs to accommodate their training needs/requirements. You can even stabilize the bar’s base with a 4ft by 8ft piece of plywood to make it ready for even more advanced skills. 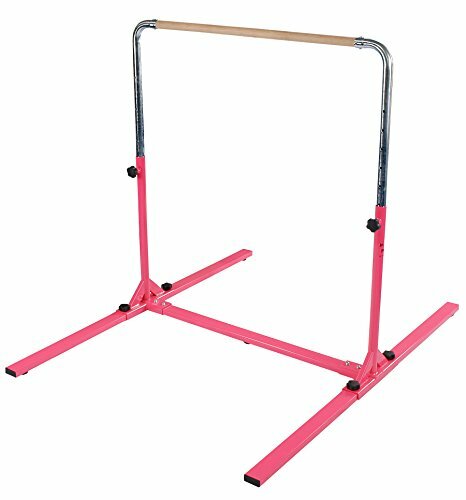 Parents, gymnasts, and coaches highly recommend this XTEK Gym Pro Gymnastics Bar. They praise it for its excellent quality, safety, and unique construction. The pro-grade comes specially designed for the young gymnasts (levels 1-4), meaning it has everything your budding gymnast needs to get started. The home training bar boasts of a premium-quality construction for quality and safety. It’s made using solid steel and aluminum metals plus the premium beech wood rail. Without a single doubt, this is the kind of construction that can withstand any form of abuse and last a lifetime. Mind you; the bar can withstand up to 140lbs user weight. It’s also worth noting that this gymnastics bar is designed to grow with your child. Yes, you can easily adjust its height from 3 to 5 ft. using the simple turn and pull action knob to match their height as they grow. Since the base of this bar comes fitted with industrial rubber end cap (100% slip-resistant! ), you can rest assured that the bar will stay in place no matter how rough the training is. This further enhances your kid’s safety. As with all the other models featured on this list, this home gymnastic bar is hassle-free to put together. This is made possible by its intuitive design and the included assembly user guide. We couldn’t help noticing this Junior PRO gymnastics bar for home use. 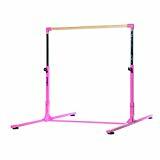 Also a proud product of Tumbl Trak, the bar is perfect for all young gymnasts who want to train at home. Like its cousins from Tumbl, this bar also comes with expert craftsmanship—with rounded corners to ensure your kid trains safely and with confidence. The junior bar is made using durable tube steel material for maximum longevity. On top of this, it has a tough powder coat finish that keeps it looking new and functional for many years to come. Its bar is made using ½-inch solid beech wood bar which is tough enough to hold up to rigorous training sessions. This is also one of safest, most stable gymnastic bars you can find on the market. It comes with a larger 4ft x 6ft floor stamp to ensure your young gymnast remains safe throughout his/her training sessions. Just like all the previously discussed models, this bar allows you to adjust its height (from 38” to 59”) depending on the age and height of your child. With only 6 knobs and 4 bolts to screw, putting together this gymnastic bar will take you a few minutes only. Another one from Z Athletic! This expendable kip bar also comes ready to help your kid explore the new world of gymnastics. It features an exceptionally sturdy design (with steel legs and high-quality fiberglass rail). The rail is then covered with non-slip synthetic wood material for comfortable grip. The result is a kids’ gymnastic bar with a pull-down weight limit of up to 300lbs and accommodates users weighing up to120lbs. The gymnastic bar is also designed to grow with your kids. This is based on the fact that you can easily adjust its height from 36 to 58 inches to fit your children training needs as they grow bigger and taller. What’s more, the bar is expendable (extension kit sold separately) when your child starts to outgrow this kip bar. With Just 10 bolts to screw in place, using a simple tool (the wrench), you can all agree that assembling this kip bar for use is extremely easy and will not take much of your time. If looking for the perfect gift for your kid to help them start exercising and achieve a healthier body shape, Costzon Junior Training Bar is a perfect choice. The horizontal training bar is designed with absolute beginners or level 1-4 gymnasts in mind, so it’s ideal for a beginner kid. The heavy-duty bar is structured using solid steel and stainless steel regulation arm as well as wood. This makes it an exceptional durable bar that lasts longer than the cheaply constructed models out there. Moreover, it boasts of welded triangle support base which enables it to support users weighing as heavy as 220lbs! This means it’ll grow with your kid(s) as they grow bigger. 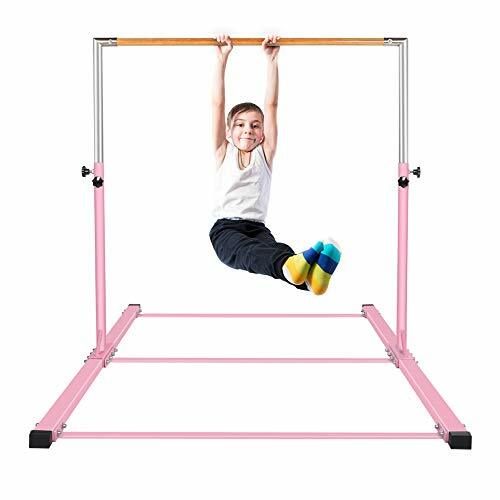 Similar to what we’ve seen in the other kids' gymnastics bars above, this gymnastic bar allows you to customize its height from 39” to 59” to match your kid’s age and height. Another thing worth mentioning is the 100% anti-slip rubber foot pads which help keep the bar stable and prevent sliding during exercises. The assembly of fairly easy for this bar and you don’t even need any prior experience. Gymmatsdirect Gymnastics Junior Training Bar is ideal for kids of all ages and all skill levels. It comes well-constructed using heavy-duty, thick steel material for maximum stability and extended lifespan. It features a stainless steel regulating arm which is rustproof, wear-resistant and good-looking. Connecting to this arm is the super-strong fiberglass bar with a maximum weight limit of 130lbs. Keep in mind that this bar is covered with slip-resistant synthetic wood material for a sure grip. The bar features special screw knobs that make it easy for you to adjust its height from 36-in all the way up to 59-in per your kid’s age or height. Unlike in other home training bars out there, no plywood is required to further stabilize this unit. It takes a floor space of around 4.2'x6,’ and it will fit a 4ft. wide mat. With its special design, assembling and disassembling this bar is easy and quick! 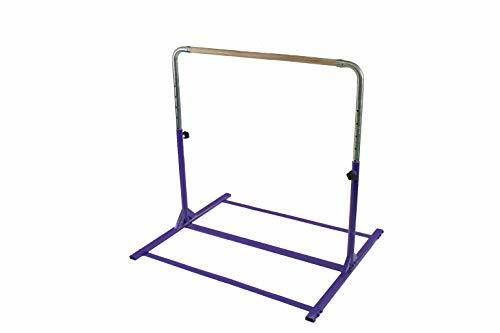 TJ Fitness Gymnastics Training Bar provides you with a durable structure, superior stability and safety, and a nice look—all at an affordable price. It’s an upgraded version of previous models from TJ Fitness with more weight on security and stability. One of the top features that make this bar a top choice for many parents is its heavy-duty square tube design. This teams up with the 2 bent connecting rods (boasts of 6x stronger anti-bending performance than flat steel!) to improve the stability and security…and hence the SAFETY of your kid. No extra extension is required to make this training bar safe. The stainless steel regulating arm offers resistant to rusting and scratches, enabling this bar to maintain its brand new look and functionality. Like in nearly any other top-quality training bar, this model provides you with a super-strong fiberglass rail—covered with Nature Wood grain. This enables it to withstand kids as heavy as 230lbs! You can easily adjust the height of this training bar from 3 to 5 ft. in up to 10 height options. To put this gymnastic together, you’ll simply need to screw in the 8ABS knobs and 10 screws. 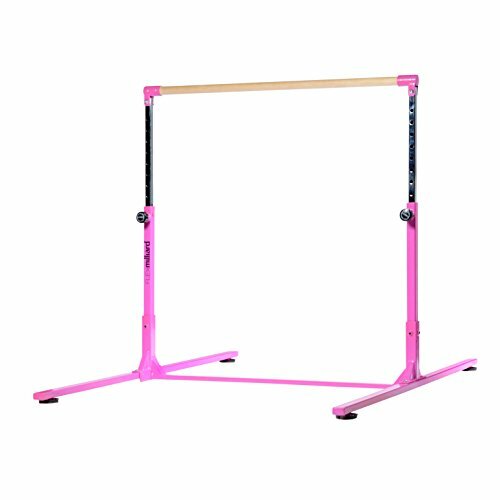 The last gymnastic bar for home on our list (but definitely not the least) is the Bestmart INC Pink Adjustable (3'-5') Horizontal Bar. This bar will also make the perfect gift for kids of all ages who are showing interested in gymnastics. As we’ve seen in all the 9 training bars above, this model also comes designed to last a lifetime. It boas of an all-weather stainless steel construction w/tough powder coating for maximum rust/corrosion/scratch-resistance. What’s more, this training bar is height adjustable. You can customize its height from as low as 3ft all the way up to 5ft—depending on the skill level and height of your young gymnast. For this reason, you can rest assured that this bar will walk with your kid from the toddler age until they become young adults. Keep in mind that the rail of this training bar is made 1.58-inch solid wood which can support a maximum of 400lbs user weight! Since the base measures approx. 3.9ft wide, it’ll surely fit a standard 4'X10' gym mat without any problems. And oh! The bar comes in purple, blue, and pink options to let you pick your kid’s favorite color. Adjustable height: 3 to 5ft. Choosing the perfect gymnastics bar for home practice can be a difficult task for most parents. While different folks might have varying preferences when choosing this equipment, there are some general guidelines to keep in mind to ensure you make a perfect choice. The MOST important thing to look for in a gymnastic bar for kids is the quality of materials and craftsmanship itself. 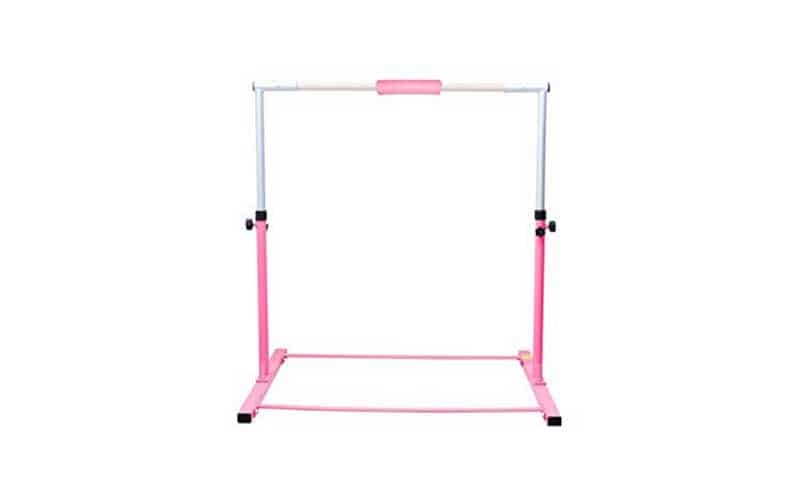 This is because the quality of this bar largely dictates the security and stability of the equipment, and thus the safety of your young gymnast. That said, make sure you pick a training bar with super-strong structure, say one made of solid steel metal. Additionally, look for welds on the bar’s frame as they contribute to the overall structure sturdiness. Regarding the bar material, it ought to be strong but flexible. Beech wood and fiberglass are usually used to make the rail. If the manufacturer doesn’t mention the type of wood they’ve used on the rail, you might want to move to the next model as they might have used some cheap wood. High-quality bolts, washers, etc., should also be used for adjustable/expandable to ensure they don’t loosen under any force and cause harm to your kid. Don’t forget to check the craftsmanship of the base width…a wider base design will ensure increased equipment stability (read safety). when buying a gymnastic training bar for your kid, you should look for a model that allows you to adjust its height. As you already know, kids grow so fast! And buying an adjustable model means it’ll grow with your kid—where you customize its height to fit that of your growing baby—letting you enjoy real value for your money. While still on it, make sure the training bar features an easy-to-use height adjustable mechanism for fast hassle-free adjustments. 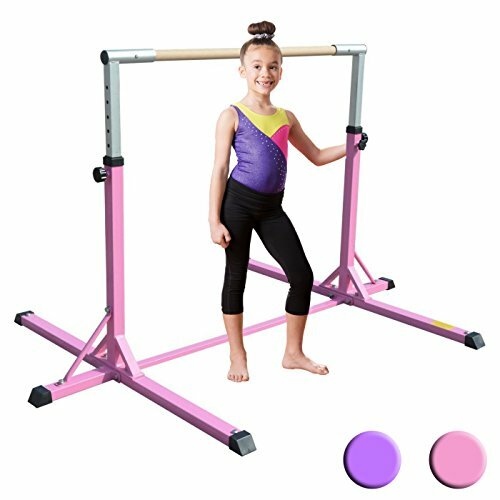 As you might have noticed in our list of the top kids' gymnastics bars above, different models vary in terms of the maximum user weight they can handle. Most manufacturers limit their bars to around 100lbs. The lower your kid weighs below the suggested weight limit, the more higher-level gymnastic exercise they’ll be able to perform on the training bar. In simple words: pick a training bar whose weight limit is way bigger than your kid’s actual body weight. Gymnastic bars for home use are generally hassle-free to put together. However, we encourage you to check what other users are saying regarding the assembly of any training bar before you buy it. The easiest to assemble modes should come with a comprehensive user manual to help even a first-time parent assemble them quickly. Likewise, the disassembly for a training bar should be easy and fast when the need arises. How much should you pay for a kids’ gymnastic bar? 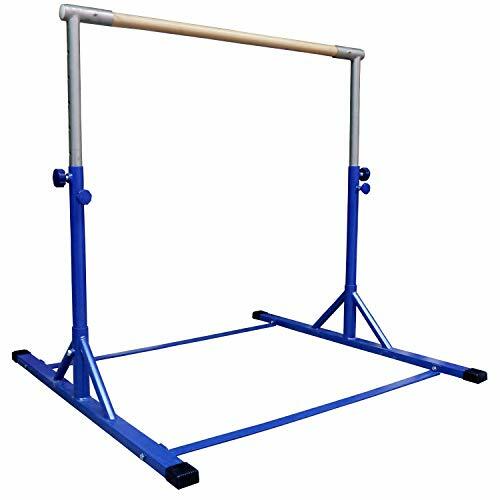 The cost of a gymnastic bar for home use can vary widely as you move from model to model. Overall, the cost ranges between $250 and $500. The average cost for a training bar is $350. REMEMBER…the more you pay for this training equipment, the better the quality, etc. Avoid buying the cheaply priced models as their quality is usually low, and they might not be safe for your little gymnast. TIP: Does the bar come with a mat? 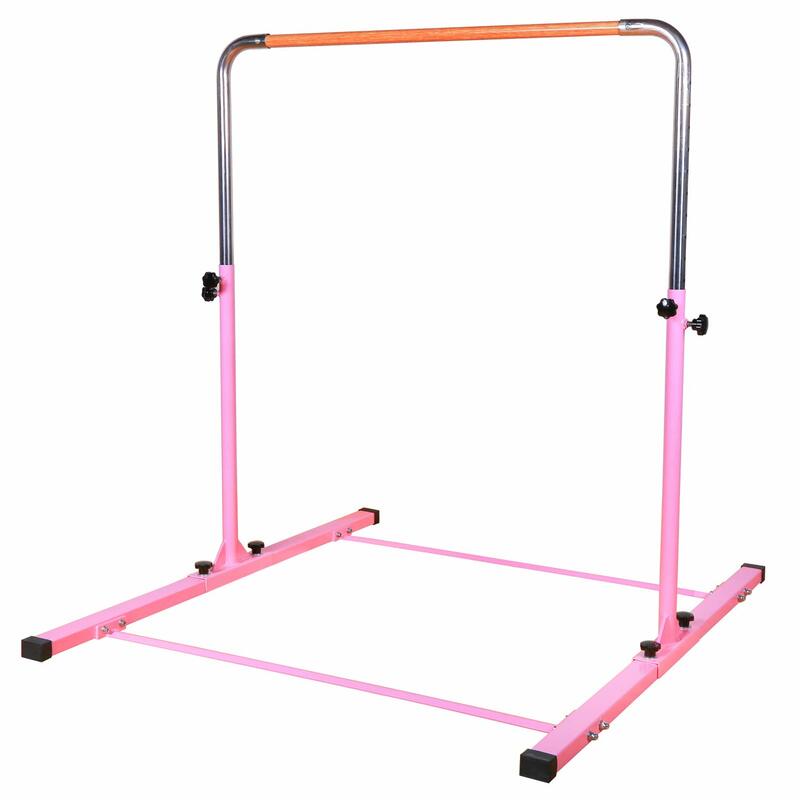 As you’re already aware, the kids gymnastic bars should NEVER be used without a mat for the obvious safety reasons. Some models are shipped alongside a mat while others come without one. If you don’t already have a mat at home, and don’t want to incur the extra cost of buying a mat separately, be sure to focus on training bars that come with a quality mat. No parent takes chances when it comes to the safety of their kids. When your child is using the gymnastics practice bar, you can put in place several precautions to keep them safe through the practice sessions. 1. Proper mats should always be placed underneath the training area. A quality mat helps cushion falls and reduces the impact on joints. Making your kids land on bare hard surfaces is infinitely dangerous! 2. Get a bar that matches your child’s skill level and age. Buying your little one a larger bar that’s beyond their abilities can be quite risky. If using a height adjustable, then ensure it’s always set to the appropriate height for your child’s age and skill level. 3. Always supervise your kids when using the bar. In the case of the gym, kids are under the guard of a seasoned instructor. But in the case of home training bar, you should be the coach. Eliminate all possible threats to your kid’s safety and ensure everything runs smoothly. The last thing you want to imagine is your budding gymnast trying dangerous maneuvers or skills that are beyond the training bar they’re using. 4. Make your kids warm up and stretch before training. Most parents don’t seem to acknowledge this step, probably because they don’t understand its importance. Without proper stretching, the muscles of your little guy might become too stiff to perform some skills. And this can result in risky pulls and strains. 5. Always ensure you set up the gymnastic training bar in a room with plenty of space. 6. Make sure your kid practices in full gymnastic uniform at all times. This is especially true for gymnastic shoes as putting on inappropriate footwear causes slippage accidents. 7. Always inspect the gymnastic bar every time before your kid uses them. Ensure all the bolts and screws are as tight as required. Make it clear to your children that you’re the only one in charge of adjusting the bar height. 8. All girls should have their hairs well tied before using the practicing bar. This will help prevent chances of their hair getting tangled in the bars and causing injuries. BONUS TIP: Make sure you prepare a list of Dos and Donts for your kid (this should be pretty easy to come up with) to observe whenever they’re using the training bar. What Is a Kip Bar? The term kip simply refers to a basic skill in gymnastics that’s performed on the men’s high bar or women’s uneven bars. The skill can be used both as mount and element or as a connecting skill in the gymnastic bar for home routine. We can, therefore, say that a kip bar is one that allows you to do the kip skill… where you (the gymnast) swing below the bar and arrive on its front support. From there, you can then do any given number of kip-related skills—like the glide kip, glide kip w/stop through, drop kip, long hang kip, and jump w ½-turn to kip. What Wood Is Used For Gymnastics Bars and Why? The most common type of wood used in the gymnastic bars (the rail part, to be specific) is the beech wood. Remember what we said earlier regarding the perfect material for gymnastic bar rail? It should be strong and flexible. These properties make beech wood a top choice for many gymnastic bar manufacturers. 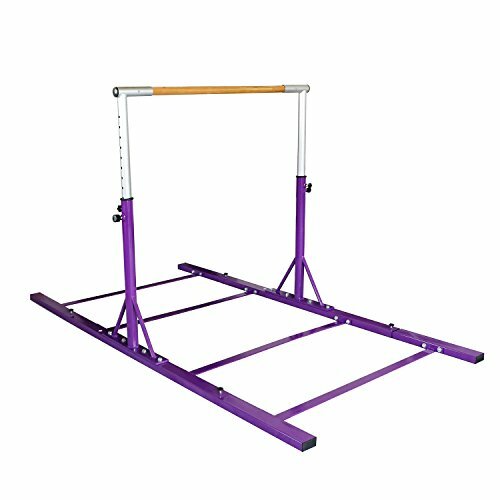 How To make a Gymnastics Bar? It’s possible to come up with your own gymnastics practice bar from scratch. Follow this link to discover the instructions and materials you need to come up with a gymnastic mini bar that your kids can use to practice at home. The whole project should cost you approx. 40 bucks. If you've got a budding gymnast at home, the gymnastics bar for home is absolutely the best thing you can gift them. This will help them perfect their athletic skills by participating in regular gymnastic trainings at the comfort of home, under your close supervision. And who knows? This simple investment might be the platform that propels your kid to become an internationally recognized gymnastics legend! While choosing the right training bar should boil down to your personal preferences, age, and skill level of your kid, you should also look at the construction quality and craftsmanship of the training bar to ensure you bag home a real deal that offers you real value for money. Our top 10 list will walk you through the highest-quality, safest gymnastic training bars you can get your budding gymnast today.